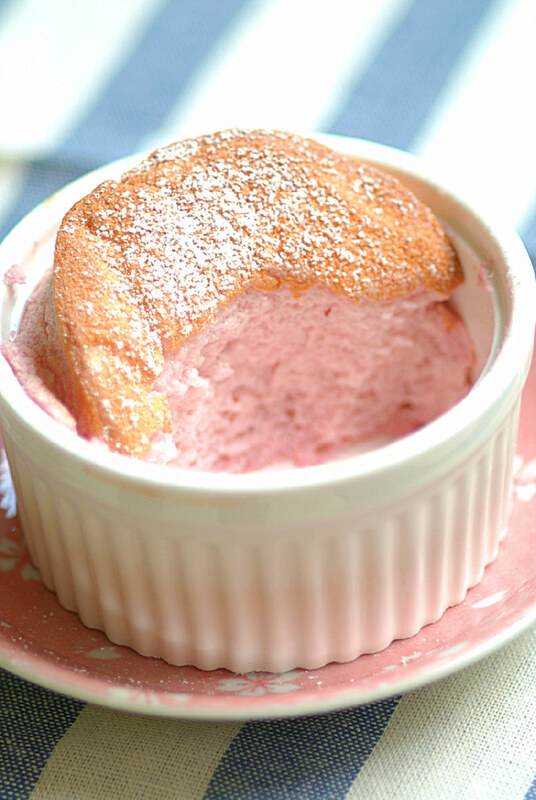 Soufflé is one intriguing animal of a dessert. The fact that it scares the most professional chefs and every time I order it I'd be made to wait for an excruciating half an hour for the deliciousness to arrive draws me towards it even more. Light and airy, fluffy and wobbly, temperamental and heart-warming, this is one dessert I'd go for as long as it exists on the menu when we eat out. While an obvious choice of flavor would be the evil dark chocolate with a sprinkle of fleur de sel, perhaps infused with some spice like cardamom or a citrus like orange, I chose to start my first soufflé baking experience with some plump raspberries. Rich, decadent chocolate soufflé, you and I will have to chat next month. 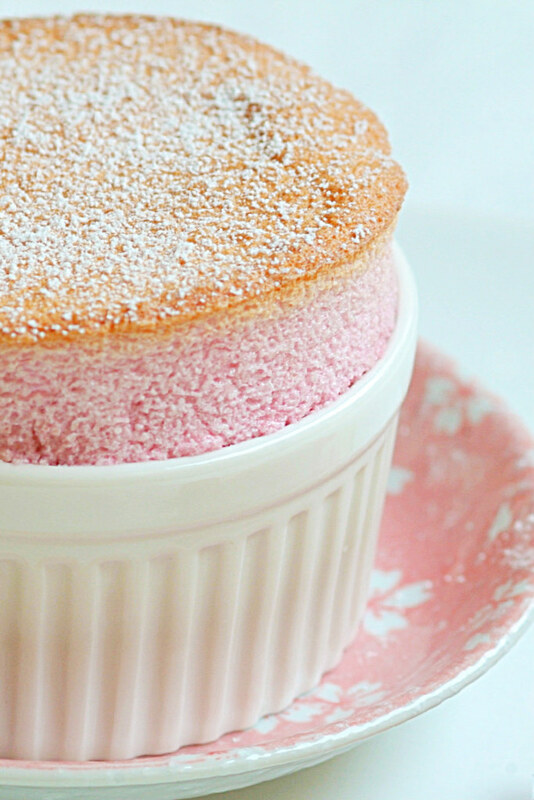 Tart, pink, fruity soufflé, you are fit to be my creation to address the month of breast cancer awareness. Right, before I continue having conversations with ramekins of warm cotton candy-like softness in my head, I'd like to thank Ellie of Almost Bourdain for sharing her incredible soufflé post. With her discovery of this fool-proof recipe, the results were all pretty and tall. Instead of tip-toeing in the kitchen - according to the urban legends of not disturbing the rise of a sensitive baking soufflé - I broke into periodical little jiggy dances around my oven watching them go up, up and up! The soufflés stood their ground long enough for the pressured excited cameraman to capture some shots. Good thing he set up a dry run with the set and an empty ramekin before they were out of the oven, just like Shirley did with her banana macadamia chocolate ones. I hope this would do justice to the pink month of October. Prerna of the beautiful Indian Simmer inspired me to make something by asking for suggestion over Twitter and all over the world food bloggers contributed their own pink creations as well. Breast cancer affected my life significantly. Thanks to early detection more than ten years ago my mother is still alive today. Since breast cancer is hereditary, there is a high risk that I too may have it. All the more reason for a day to be spent remembering that with some care and responsibility towards the wellness of our bodies we can fight the disease and stand triumphant, just like a perfectly risen soufflé. 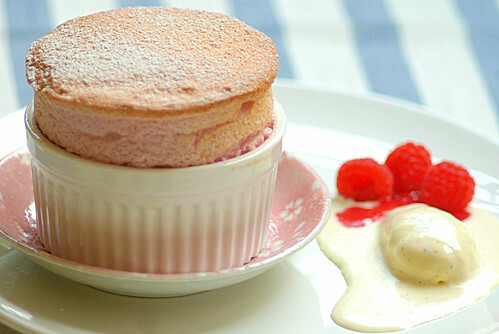 Adapted from Almost Bourdain's Lemon, Lime and Orange Soufflé, original recipe from Raspberry Souffle in Serving The Menu Again by Ben O'Donoghue and Curtis Stone. Sheena: Have no fear! Try this, it's my first time making one and it works! Shirley: Thanks, will definitely try yours too. Macarons and souffles are two things I'm so scared of attempting for the sheer surety of failure I'll face! But seeing so many beautiful pinks this season that I'm thinking of giving it all a try after all. Tis is beautiful and for a great cause. Kulsum: You should try it, it's much easier than a macaron I'd say. One very pretty souffle!! Love your presentation with the dusted sugar. Thanks Soma, do try it! 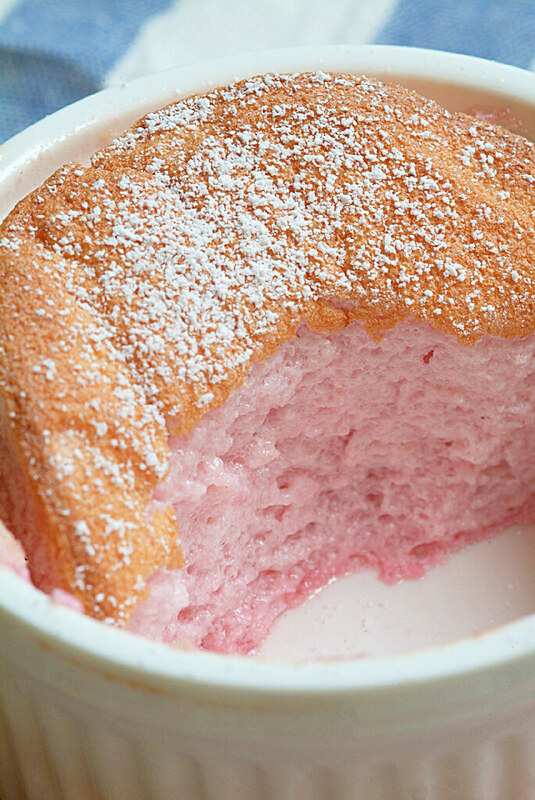 Love the cloud-like fluffy texture and the sweet lovely colour of your souffle. Thanks diva. I'm really looking forward to the chocolate one too! this is beautiful, and thank goodness the disease was discovered early for your mom. 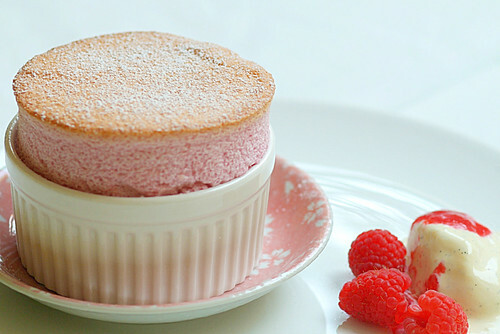 souffle is actually something i'd like to master and your pictures really makes me want to make a go of it.. soon. thanks for sharing. Lan: With souffles it's never a guarantee, even pros have their flop moments. I'd say perhaps I have beginner's luck. This recipe is fool proof though! what type of oven are you using? mookerah: Thanks! I'm using a wall unit convection oven. For all my baking I turn the fan on. this absolutely looks beautiful! could you please tell me where you attained rose essence? i've been looking for it everywhere and i just can't wait to make rose-flavored desserts! Laura, are you in Singapore? You can get it from Shermay cooking school at Chip Bee Gardens, Holland Village. They are a bit pricey but the quality is better than those from Phoon Huat. oh no, i'm not! i'm in the united states. it seems they're harder to get in the US than anywhere else. Ah I see Laura, but in US go to Amazon. I tell you they sell everything and if shipping doesn't cost a bomb I'd order a lot of things from them. This is exactly the one I'm using. I made this for Valentines Day- worked perfectly! Looked beautiful but tasted more like egg than raspberry- any trick to avoid this?? Anon: You can try using 8 eggs instead of 10, though I don't face similar issue with mine as the raspberries we get here are pretty tart. Lindsey: Feel free to skip the rose extract. 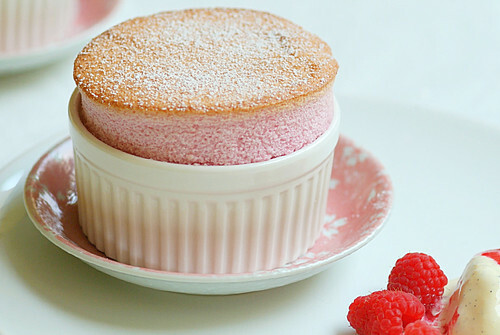 The result will be just a plain old raspberry souffle. How does this recipe serve 8 people when you are filling only 6 ramkins? Someone ain't gettin' any....nonetheless, I just returned from a French restaurant that served a raspberry souffle and I am determined to make my own! Corn flour in this recipe seems odd, but will make it totally gluten free, which is a good thing for some.